Congratulations to our Client KESS InHouse for their feature in Dabble Magazine! Let your mouse and keyboard sit on a splash of color! 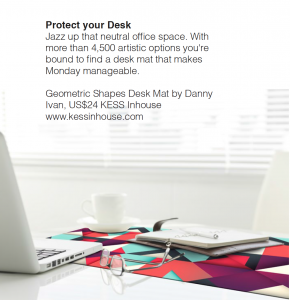 Personalize, decorate, and organize your office space with aÂ high quality desk mat fromÂ KESS InHouse. Brighten up any office space while offering a superb writing surface that will not indent, scratch, or stain. Use your favorite artwork for desks, tables, or any work surface. Great as mouse pads and for holding your keyboard in place while you work.